Gene (Nikita Burshteyn) and Helen (Amie Shapiro) share a dance. Photo by Ben Krantz Studio. But Saturday Night is more than just a curiosity for Sondheim fans. Its central premise – that young men want to pick up chicks and get rich quick, and come up with a lot of hare-brained schemes on both accounts – still rings true today. San Francisco in 2018 is a boom town full of striving young people and decadent millionaires – as was New York City in 1929, the setting of Saturday Night. The show’s protagonist, Gene (Nikita Burshteyn), comes from working-class Flatbush, Brooklyn, but he yearns to make it big in the stock market and join high society. Burshteyn is tall and very suave, though I sometimes had trouble hearing the lower range of his voice over the 3-piece band. A bigger problem is that Gene isn’t a very likable character. His introductory song “Class” makes him seem like a snob, and he makes some very foolish decisions throughout the course of the story. In this, though, could he be the first Sondheim antihero – a precursor to Bobby in Company or Georges in Sunday? Celeste (Courtney Hatcher) and Mildred (Caitlin Waite) go to the movies. Photo by Ben Krantz Studio. Gene’s male friends from the neighborhood are a group of wisecracking, bickering fellas, and the musical gently mocks their attempts to scrounge up dates and play the stock market. In contrast, the women of Saturday Night are more level-headed and practical – and it's nice that the musical ultimately vindicates their point of view. Celeste (Courtney Hatcher) has a fun song where she compares the mundane reality of Brooklyn life to the fantasies of the silver screen. Gene’s love interest Helen (Amie Shapiro) initially seems to have the same taste for the high life as he does – they meet when they both attempt to crash an Upper East Side party – but she never forgets that she is the daughter of a poultry dealer. Perhaps my favorite character, though, was the scene-stealing Mildred (a hilarious Caitlin Waite), Celeste’s mousy but excitable friend. Bethany Deal’s costumes are full of fun 1920s details but Brian Watson’s set, based on the stone Gothic arches of the Brooklyn Bridge, would be better if it allowed for more of a contrast between the Flatbush scenes and the Manhattan ones. I do have to note that while the 42nd Street Moon cast is talented and charming, it is not very ethnically diverse. Since the same motivations animate young people in 1929 New York and in 2018 San Francisco, couldn’t we have a cast that reflects 2018 San Francisco as well? 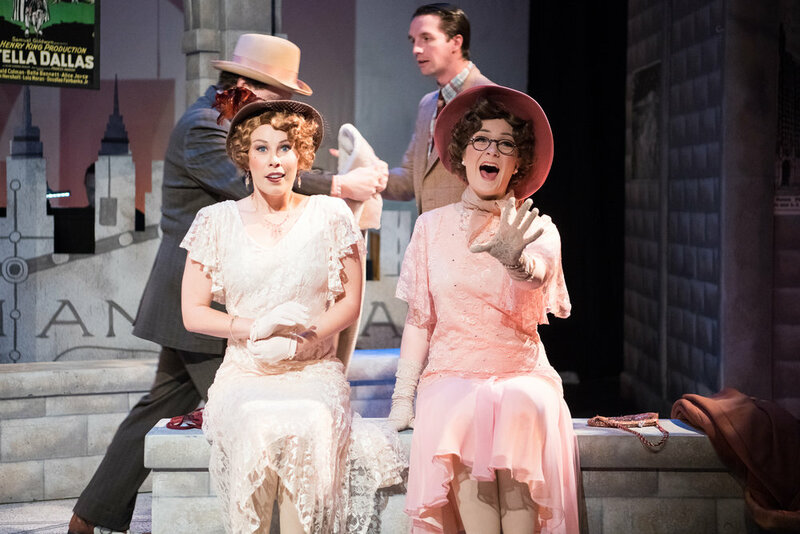 42nd Street Moon’s production of Saturday Night plays at the Gateway Theatre, 215 Jackson St, San Francisco through April 15. Tickets and more info here.